Posted on April 21, 2017 , in Swim Spas. As soon as you buy a swim spa, it’s time to prepare for the installation process. While installation may seem overwhelming, if you know what to expect it will be far easier. Below you’ll find out the steps to take to prepare for the delivery and installation process. Before you buy your swim spa, remember that the delivery cost is often not included in the price. It is typically dependent on how far away the destination address is. Ask your dealer about delivery and installation costs before you commit to a swim spa so you know you can afford it. 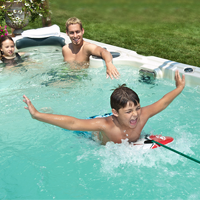 You have many installation options with a new swim spa, including above ground, in ground, and the specific location. While above ground installation is cheaper than in-ground, in-ground installation can be more aesthetically pleasing and add more value to your home. Prior to installing your swim spa, you’ll need to have a contractor put down a 6-inch concrete pad with a rebar inlay. An electrical line must also be built into the pad. Make sure these steps are in order prior to your installation date. When the swim spa arrives, it will be lifted from the truck by a forklift or crane and lowered into its location. When choosing between forklift and crane installation, remember that a forklift is often cheaper. You should also inquire with the contractor for the exact cost of installation. The top priority for installation of a swim spa is safety. Make sure to work with a licensed electrician who has experience with pools and spas. This will ensure that the wiring is installed safely so you don’t have any problems with it in the future. If you don’t know an electrician personally, ask your friends and neighbors with swim spas or swimming pools for referrals. Now that you’ve learned about how to prepare for swim spa installation, download our buyer’s guide to discover the perfect swim spa for you.